Babar never gets old. I remember watching the shows when I was a kid and how I loved it! It teaches kids valuable lessons instead of the junk they have TV nowadays. My daughter and I had the privilege of reviewing this great digitally restored and remastered Best Friends Forever DVD that teaches kids about cooperation, understanding, and teamwork. While Isabella doesn’t quite understand the morals taught, she was quite into the DVD! 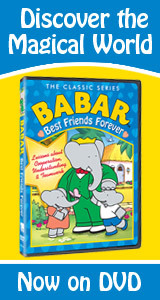 Best Friends Forever includes four classic episodes: City Ways, Between Friends, Friendly Agreement and An Elephant’s Best Friend.